Kirstie Alley: From A 14 To A Size 4? Great recipe! I would just use Dreamfields pasta instead of regular pasta! I tried this recipe yesterday. So easy, pretty cheap, and extremely yummy! This is definitely a keeper. Thank you! 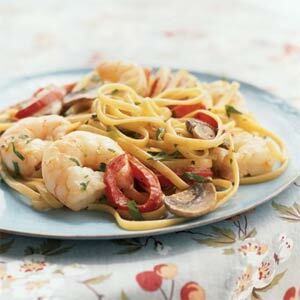 I tried this last nite, and substituted the shrimp with chicken. I still turned out yummy! Is there a substitute for the mushrooms? I love them but my son is allergic…HELP! !